It’s almost summer! Are you ready with summer essentials for your activities under the sun? On a hot day, skin often produces more oil. However, this does not mean that our skin is not dehydrated. Over production of oil can also prevent hydration to absorb into our skin, and can cause dehydration. Therefore, you should use water-based skincare that can balance hydration in the skin. Try Hydra Botanic series that have dual benefits, moisturizing and cleansing throughly so skin is healthy even in hot weather. Start your day with a moisturizer that contains SPF to protect your skin from damaging UV rays that can cause premature aging dan dullness. 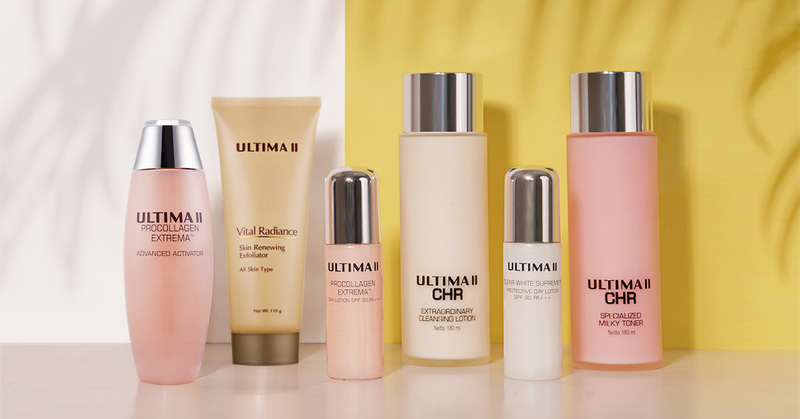 ULTIMA II has the best day lotions that can moisturize the skin and protect skin from UV. If you want firmer skin, you can use ULTIMA II Procollagen Extrema Day Lotion. It contains SPF 30 PA+++ that protects your skin from UVA and UVB, and has Collagen from ULTIMA II Procollagen Essence formula. For those who want brighter skin even though being under the sun, you can choose Clear White Supreme Protective Day Lotion. It contains SPF 30 PA+++ with brightening formula SEPICALM™ and SEPIWHITE™MSH, which are effective in brightening and even skin tones. This lightweight moisturizer absorbs fast, a perfect choice for a sunny day! To refresh your skin on a hot day, you can use Procollagen Extrema Advance Activator by spraying it on your face using a spray bottle. Containing antioxidant Vitamin E and ULTIMA II Procollagen Essence, it can help taking care of aging signs and boost the benefits your other skincare products. Spray after cleansing your face first.